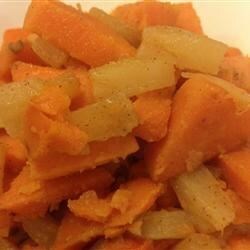 "A super-easy side dish that has always been a hit with my family for both Thanksgiving and Christmas." I made this for my family at Thanksgiving...they all raved! So much better than any I've had before. I even used canned yams and they were still yummy! I made this for Christmas dinner and it was a huge hit! I added some chopped peacons for a garnish. The addition of maraschino cherries adds something special to this wonderful dish! Perfect for holiday dinners, but my husband and I cheat and eat it throughout the year ... Shh! Thanks Delora!